Specially designed empty wooden crates are loaded onto the truck with a forklift. 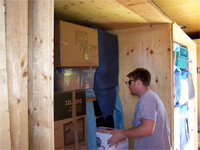 This allows for all of your furniture and household items to be loaded directly into the containers at residence. When our staff arrives at your residence, the driver prepares an itemized inventory of all items to be stored. All items in your household will be tagged with a number that correspond with a detailed description on the list. While the driver is preparing the inventory, other staff members will lay down floor runners, perform any necessary disassembly of furniture items, and stretch-wrap all upholstered items. 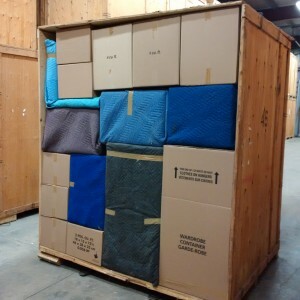 When the inventory is complete, our moving team will proceed to load your items directly into the containers on the truck. 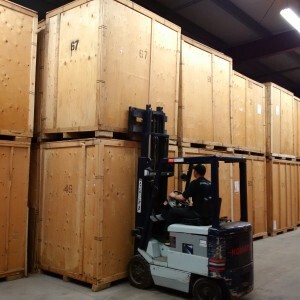 When the loading is finished, all crates will be closed and transported back to the storage facility. 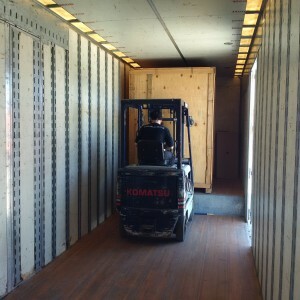 The loaded storage containers will be lifted off the truck with a forklift and placed in the storage facility. When it is time for your items to deliver out of storage, the full containers will be fork lifted directly onto the truck and our team will proceed to your new residence. At the new residence your items will be unloaded directly out of the container. When our team begins unloading at your new residence, you have the option of checking off each item on the inventory list as it is brought into the house. Someone from your end must be provided to do the check off during the unloading process. The check off process may prolong the unloading process, which may incur further charges, depending on the volume of your items. 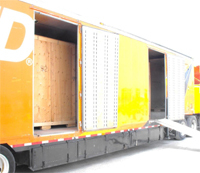 After unloading all of your items, our team will reassemble any items that were dissembled during the loading process. Our team will also remove all plastic wrap from upholstery and place all furniture in the location you desire.